The Abyssinian Lovebirds or Black-winged Lovebirds (Agapornis taranta) are African endemics that occur naturally in the mountainous areas of Southern Eritrea and the southwestern highlands of Ethiopia, up to an altitude of 1,800-3,200m (6,000 - 10,000 ft) above sea level. Locally, this bird is sometimes referred to as "Taranta" - after the Pass of Taranta in Ethiopia, where they occur naturally. The Abyssinian lovebird is highly social and as a pet, is most commonly kept in pairs because of their need for constant companionship and mutual preening. They typically live in small flocks of 4 to 20 birds. Length of male 17 cm average, female is usually slightly bigger.Average weight 48 g, female usually slightly heavier.This species can be very affectionate when hand-raised, yet if kept singly, it will need a lot of human interaction and time to stay tame. Because there is a limited quantity of these parrots, most are entered into breeding programs. Lovesbirds, There are two subspecies of the Abyssinian Lovebird or Black-Winged Lovebird; Agapornis taranta tarana and Agapornis taranta nana. The latter species is a bit smaller and has a more intense coloration. It also has a smaller bill and shorter wings. Smaller than the nominate species, with a more intensively colored plumage. It has shorter wings and a smaller bill. Interbreeding is likely to occur in captive situations. Individuals occurring at higher altitudes are larger, but they are not subspecifically recognized. They are very social beings and are typically kept with another lovebird as companion to satisfy their strong need for companionship and they spend a good part of their day socializing and preening each other. Hand-raised Abyssinians also make affectionate pets - although they do need a lot of attention if kept singly. Because the Abyssinian lovebird is social, it is thought best to keep them in pairs rather than singly to keep them happy and healthy. Although this species is quieter than many lovebirds, they have been known to call out in the middle of the night when they get upset. Additionally, because the Abyssinian lovebird eats seeds, berries and fruits, such as sycamore figs and juniper berries in the wild, a similar diet, with a higher fat content than other lovebirds, is required for them. Their natural diet is quite diverse. They will feed on various small seeds, especially savannah grasses. They particularly seek out berries, fruits - the favorite of which being the fruit of the sycamore fig. They will feed heavily on the berries of the juniper tree, which in large amounts is poisonous to some birds and mammals. The juniper berries have a very high Vitamin B content -- which meets the specific dietary requirement of the Abyssinian Lovebird. In fact, the lack of success in keeping captive specimen alive is thought to be caused by a diet low in Vitamin B.
Captive birds should be fed a diet as close to their natural as possible. Typically, this will include a good quality lovebird / cockatiel seed mix that includes a variety of *seeds (millet, canary, sunflower. buckwheat, niger, hemp, safflower, peanuts, sweetcorn, linseed, corn, pinenuts, barley), fruits and vegetables (apples, oranges, kiwi fruits, fresh figs, berries, *juniper berries, spinach, carrots), green food (dandelion leaves, cabbage leaves, etc. ), and commercial pellets (the latter of which is controversial, as pelleted diets generally contain many chemicals, synthetic nutrients, and other inferior ingredients). 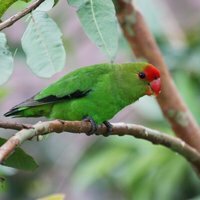 The Abyssinian Lovebirds' breeding season within their natural range is recorded to commence in April and continues through September. However, nests with eggs have been found as early as March and chicks were produced as late as early November. Their mating display is quite interesting. The male may jump over and around the female, with some shaking and scratching of the head to add interest. Once she is satisfied, she will let him know that she would like to be fed. He regurgitates food held in his crop into her open beak. The nesting area is chosen by the female. It could be a crack in a rock or the dead limb of a tree, or a tree cavity. Outside the breeding season, these lovebirds typically use the chosen nesting area as a continuous roost for many years. During the breeding season, Abyssinians are very territorial and protective of their nesting area, which they will vigorously defend against other pairs or intruders - to the death, if necessary. They are not great nest builders and usually use very little nesting substrates. Materials found in nests have included bits of grass, bark, leaves, and the chest feathers of the hen. The average clutch consists of 2 or 4 white eggs (rarely 5). The hen may start incubating after the first or second egg has been laid. The incubation period is about 23 - 25 days and the young leave the nest about 45 days after hatching. The newly hatched chicks are covered with fine grey-white down, which will rapidly thicken as they grow. At around seven weeks, they are fully feathered and ready to leave the nest. After fledging, the young will remain close to the parents who will continue to feed them for several weeks afterwards. In the wild, the Abyssinians tolerate their young quite well and form family units with them. The young from previous years often assist their parents in raising the next generations. Two kinds of nestboxes can be used parakeet boxes that measure 4 x 4 x 4 and have an entrance hole in the upper center of the box. Slant nestboxes usually work when budgie boxes don't. Nesting material, or lack of, has been one of my biggest problems. Some Abbys use their own feathers but mine don't. Pine shavings are quickly discarded, as is most anything else I put in the box. The Abyssinian Lovebird is one of the largest lovebirds measuring between 6 - 6 1/2" (15 - 17 cm) in length (including tail) and averaging around 1.7 oz or 48 g in weight. Females tend to be a little heavier, reaching about 1.9 oz (53 grams) while males usually weigh around 1.6 oz (44 grams). The nominate species (Agapornis a. nana) is slightly larger than its sub-species Agapornis taranta nana. Males and females are sexually dimorphic, meaning they can be visually sexed, contrary to most other lovebird species, where males and females look identical. Some color mutations have been bred in recent history. This bird has a less shrill call than that of other lovebirds, though it will call out in the middle of the night if it gets upset. Lovebirds in general can be rather noisy for parts of the day. See About Lovebirds: Potential Problems for information on illnesses.